Love ability to use offline. Intuitive navigation and markups. I use this more than any other Bible app. Simple, straight forward, easy to use. This has become my default Bible. 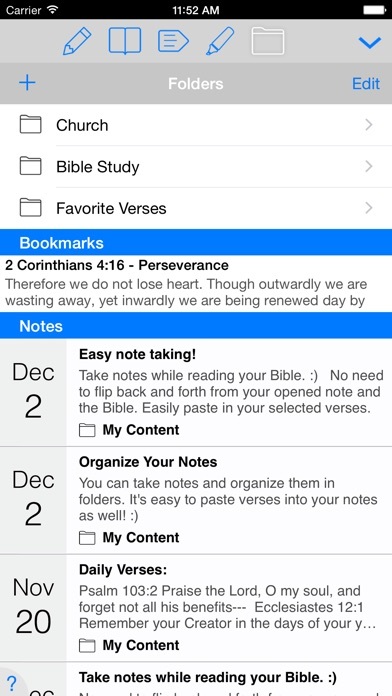 I am a young pastor and have found this app a huge help in having my notes and scripture all in the same app. Love it! I am a big fan of the ESV and like how the app handles search and scripture look up. Keeps notes across multiple devices. Convenient to look up bible verses in a hurry or for Sunday service. I have enjoyed this app so much. Easy to read and simple to use. Great bible study app! This is my favorite Bible app, and I use it all them time. Thank you Tecarta! I have really enjoyed having this version of the Bible. It is the one read in our church. It is easy to use. Easy to use and easy to read. Lots of options on versions, helps, font size, etc. I really like that it's on my iPad and so readily available. Very user friendly. I love the Bible verse search feature. There are several Bible apps on my iPad and iPhone, and this one is always the go-to one. Stable platform, solid functionality, and easy to use features. Especially like the multi-colored highlighting capability; use that function to separate reference verses every week preparing Sunday School lessons. I bought this app for its fast lookup feature. I keep discovering more and more great stuff in it - highlights, notes & bookmarks grouping, version comparison... An excellent app! The ability to highlight and sync it up with other devices it's worth five stars alone. My go-to Bible app. Love that I can copy and paste text. The search engine is the best I have experienced. I have highly recommended this app to my friends. Thanks!! Great app - thank you! Would love to see a more complete version with notes, maps, pictures, articles, etc, like that of the ESV Study Bible. I use this app as my goto bible now. I highlight, I take notes, I even copy and paste verses and e-mail them with thoughts to friends. Easy to use, and easy to learn, best money I ever spent on an app for my iPad. This app is my favorite Bible app. It works well and has easy share features. I hate to sound repetitive but this is truly an awesome app! What a wonderful way to spread the good news of our Lord and Savior! Jesus reigns! I've tried several downloadable and online bibles. I go back to this one because it's easy to navigate (especially with the upgrades) and helps are accessible. The focus is on reading the bible, not bells and whistles. I like being able to set the way I find Bible passages. I prefer the three click so I don't have to scroll down to verse 127 all the way from verse 1. The ESV version is clear, consistent and easy to understand. Flexible. Reliable. Remarkable. Love this. I think this is the best bible app. It has the features I was looking for. Recommend to anyone who uses notes and plenty of bookmarks. I was not sure I would use the app in the same way I depend on my printed Bible. 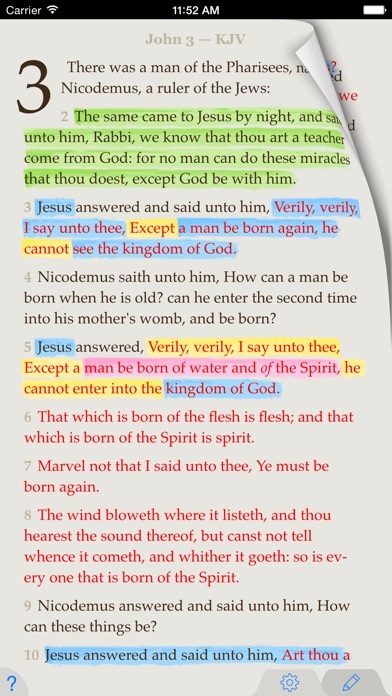 But over the past few years, the app has become my primary use; it is great for Sunday School, and church, because I can highlight, make notes, cross reference and not distract others. I love being able to keep my notes with the scripture and I love looking back on the last 50 verses I read. A big plus for me is I can read anywhere, anytime, without using data. When waiting for an appointment, or in bed when everyone else is asleep, it is quiet and available. 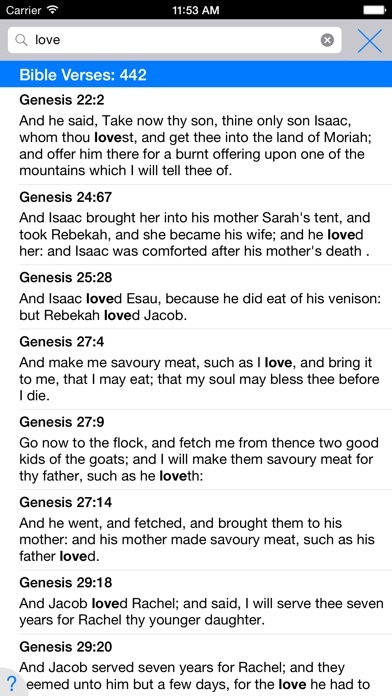 I also love the audio feature,; it helps me learn how to pronounce names and places, and when reading through the Bible it allows me to stay on tract. I have had other Bible apps, but this is superior by far. I always found the older versions cumbersome to use. This one is really good once you get familiar with the icons. It also includes the 2 or 3 tap verse selection which I really like. ESV is a more literal translation. Good for those who are already very familiar with God's word. It want open please help!!!!!! I love this translation and the easy-to-use features INCLUDING various highlighter colors. I love this app! The only feature i would like to see changed: when using cross references I would like a way to get back to my original text with one touch. The only way I have found to get back to the original text and cross references, is to start completely over. Easy to use, lots of great features. Ability to add multiple translations. Great app. Excellent resource, I use this Bible every day. The look is smooth and the readability of the text is great. Finding verses is easy and efficient. 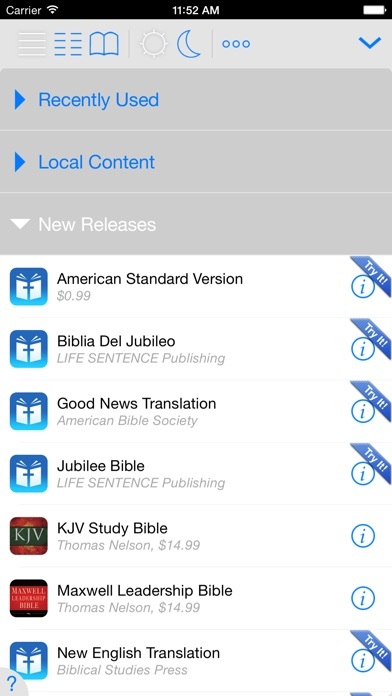 Other versions and commentaries are available within the app. I have found no need to use bible apps. But please check 1 Samuel 13:1. Text appears as follows, "1 Samuel 13:1 ESV  Saul was . . . years old when he began to reign, and he reigned . . . and two years over Israel." I love this app and have other versions of it as well. Others in church have seen me using it and have switched from the app they had been using to this one. I highly recommend it. Easy to use. A quick reference and great translation. I'm excited to explore more features. This has been my "go to" Bible for a little over a year now. The new updated interface is, in most ways, a welcome update. I haven't been able to figure out how to highlight verse portions, but that's a pretty minor issue. The note taking functionality is the best, and most flexible I've seen and is the reason I bought—and continue to use—this app. Really great app, works well, very worth the price. Receives regular updates & very intuitive. This app is worth purchasing. It's easy to navigate and has very usable features. I have had almost no problems with bugs and glitches—specifically when other Bible apps on my computer have crashed. I've used this to prepare messages, to lead Bible Studies, for devotions, and for seminary classes. It can seem a bit pricey on the front end but is entirely worth it. Has more helps and attributes then I can use! Like having ESV for my study...readable. I love this app! It is the best possible way to start my day. All praise Jesus Christ our Lord and Savior!